Confiscated from the above by the Einsatzstab Reichsleiter Rosenberg on 5 September 5 1941 (ERR inv. No. PR 5); Transferred to the Jeu de Paume, Paris, 6 September 1941; returned to the Möbel Aktion for sale and intended for transfer to Nikolsburg, Moravia, August 1, 1944; Recovered by the French Resistance and restituted by the Commission de Récupération Artistique to Paul Rosenberg, 14 September 1945. Marlborough Fine Art, Ltd., London. Mr. and Mrs. Frederick R. Weisman, Beverly Hills (acquired from the above, May 1962). Paul Kantor Gallery, Beverly Hills. Thomas Ammann Fine Art, Zürich. Anon. sale, Sotheby's, New York, 16 November 1998, lot 69. C. Zervos, Pablo Picasso, Paris, 1958, vol. 9, no. 276 (illustrated, pl. 129; with incorrect support and dated 29 March 1939). The Picasso Project, ed., Picasso's Paintings, Watercolors, Drawings and Sculpture: Spanish Civil War, 1937-1939, San Francisco, 1997, p. 233, no. 39-064 (illustrated; with incorrect support). P. Shea, ed., Picasso to Pop: The Richard Weisman Collection, New York, 2003, pp. 46 and 124 (illustrated in color, pp. ii, 47 and 124). Zürich, Thomas Ammann Fine Art, Major Works from the Weisman Collection and Other Private Collections, June-September 1990, no. 22 (illustrated in color). Zürich, Galerie Art Focus, Picasso, Retrospektive, April-September 2000, p. 78, no. 27 (illustrated in color, p. 79). Kunstsammlungen Chemnitz, Picasso et les femmes, October 2002-January 2003, pp. 218 and 390 (illustrated in color, p. 218). This Buste de femme is instantly recognizable as Dora Maar, dressed, however, for a part which nothing in all her previous pictorial role-playing has prepared her, and she would never be called on to perform again, in a field of endeavor far removed from the reality of her everyday life. She is about to embark upon, allegorically speaking, a supremely demanding mission Picasso has entrusted to her. Girt in armor and ready to take up sword and lance, she has here become the incarnation of the archetypal fighting queen, heiress to Penthesilea and Hippolyta, Amazons of distant classical antiquity. And beyond this typically mythical dimension in Picasso's iconography, this woman warrior moreover possesses, true to her purpose, symbolic nationalistic significance, as a figure who is both historical fact and the potently emblematic stuff of patriotic legend. Dora prepares to battle, pour la France, in the guise of a 20th century Jeanne d'Arc. Dora had already done service two years earlier as the Weeping Woman (Zervos, vol. 9, no. 73; fig. 1), soon after Picasso painted Guernica. Here she widens her eyes--in the shapes of glowing red cherries--as if mesmerized, staring in the face a challenge far greater than any she has ever known, a clear and present danger, and more of the same in the distant shape of things to come. Picasso had already made Dora his modern Sybil, employing her as a silent oracular presence whose facial expression of inner distress bespeaks her prophecy. And now she has heard a voice--just like Jeanne la Pucelle, as Bastien-Lepage portrayed her in his famous painting of 1879 (The Metropolitan Museum of Art, New York)--not from God in this instance, but from Picasso, a call which has summoned her to take up arms, in response to the historical exigencies arising from events of the day. Stunned at first, she here gathers that measure of resolve and courage required for the enormity of her task, and prepares to carry on as the selfless heroine whom destiny has claimed for its unknowable ends. This is not a painting Picasso would have done during his pleasant summer holidays with Dora and their friends on the Riviera during the calm before the storm. As the decade of the 30s wore on, the artist coerced Dora's mysterious and inscrutably impassive visage into an increasingly agonized reflection of the ominous and troubled mood in Europe during the years of the Spanish Civil War, and subsequent events leading to the outbreak of the Second World War on 1 September 1939. Picasso painted Dora as Jeanne d'Arc, the Maid of Orléans, on 28 March 1939, not quite two weeks after Hitler and his armies entered Prague under the terms of appeasement granted him in the Munich Pact, which had been signed the previous autumn. Neville Chamberlain, the British prime minister, famously announced when he returned to London from the talks that he was "bringing peace with honour. I believe it is peace for our time... Go home and get a nice quiet sleep." Picasso did not believe him for a moment. Even worse for Picasso, moreover, was that on 28 March Madrid finally fell to the unrelenting onslaught of General Franco's fascist legions. Barcelona had already surrendered two months earlier. The dream that Picasso and many of his friends, both Spanish and French, had held out for a socially progressive and culturally enlightened Republican Spain was dead and buried. The artist was quick to realize, as did many others among the left-leaning intelligentsia, that the whole of Europe would be next in line, to be devoured piece by piece, like the helpless bird falling prey to the prowling feral cat he painted several weeks after the present portrait of Dora (Zervos, vol. 9, no. 297; fig. 2). "It is my wish at this time," Picasso wrote to a meeting of the American Artist's Congress in New York, "to remind you that I have always believed, and still believe, that artists who live and work with spiritual values cannot and should not remain indifferent to a conflict in which the highest values of humanity and civilization are at stake" (printed in The New York Times, 19 December 1937; D. Ashton, ed., Picasso on Art, New York, 1972, p. 145). Marie-Thérèse Walter, Picasso's other, more tenured mistress, had been the primary female presence in Guernica. Picasso now preferred to spare her, as the mother of their child, from further encounters with danger and violence, making her instead into an alternative and private symbol of quiet domesticity and peace. Dora alone would have to bear the brunt of Picasso's war-time depredations (Zervos, vol. 10, no. 192; fig. 3). "After World War II broke out," John Richardson has written, "Picasso came to portray Dora more and more frequently as a sacrificial victim, a tearful symbol of his own pain and grief at the horrors of tyranny and war" ("Pablo Picasso's Femme au chapeau de paille," Christie's New York, sale catalogue, 4 May 2004, p. 113). Portraits of Dora pre-dominated, in which she is often--as seen here--bust-length, in many versions seated on a chair, an extension of his pre-war series of femmes au chapeau and femmes assises. Dora resumed her role as prophetess: like Cassandra of mythology and in classic drama, she would endure the frantic frustration of a seer who can foretell the future but is cursed by fate that no one will believe her--except Picasso, that is, who makes her the medium through whom he publicly reflects on events past, current and future, albeit in veiled, allegorical imagery. He continued to alter and reshape her visage in new, astonishing if often frightening ways: she neither protested nor resisted, it was a role she accepted almost masochistically. Dora's cherry red eyes in the present portrait allude to the Passion of Christ, the ultimate sacrifice and martyrdom; artists often included cherries in their table settings of the Last Supper. Jeanne suffered a similar fate; she was beatified in 1909, and awarded sainthood in 1920, although she had long been popularly celebrated as France's patron heroine. 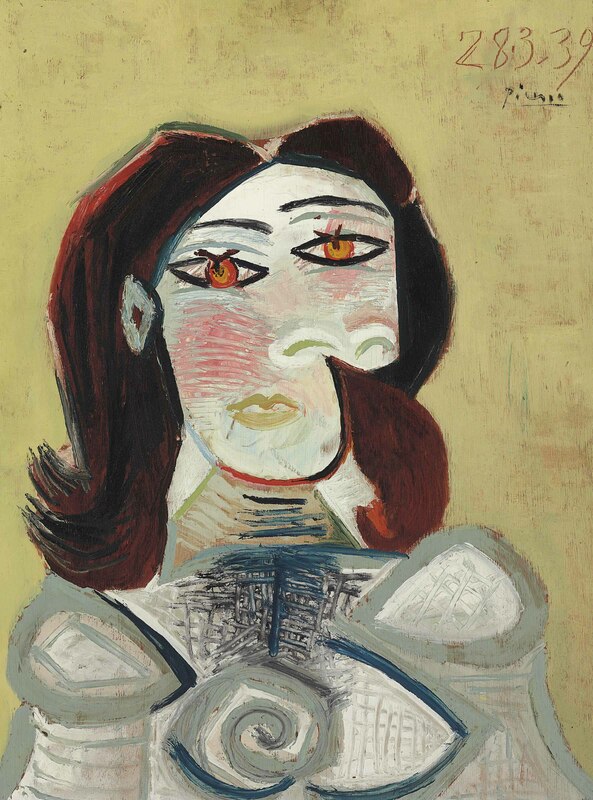 Dora was raven-haired, but here Picasso has given her red highlights to match her eyes. Jeanne d'Arc, although described in her trial records as having black hair, was often portrayed as a red-head, suggesting her acceptance of the fiery, bellicose spirit she would need to achieve the redemption of her king and country. Dante Gabriel Rossetti portrayed her as such in his 1864 painting (Tate Britain, London), partly out of the general Pre-Raphaelite proclivity for impassioned, erotically charged red-heads; and Tamara de Lempicka more recently employed a copper-haired model in her depiction of Jeanne receiving the call, painted in 1932 (Blondel, no. 164). From his knowledge of the old masters, Picasso was familiar with late medieval plate armor, and gave an accurate account of its appurtenances here. Dora is seen wearing the protective shoulder guards known as pauldrons, below which the joined bands called spaulders encircle her upper arms. Picasso's version of a knight's breastplate makes allowances for Dora's formidable dagger-shaped breast, and it may even appear that she has cut down her right breast, as Amazons are reputed to have done, in order to more freely wield a bow and arrow while hunting and in battle against men. There are six other images that Picasso painted of Dora during late March 1939, including several on wood panel, one of which (fig. 4) was painted on the same day as the present painting. Picasso in that version gave Dora yellow-orange hair; she is not, however, clad in armor. Indeed, she is wearing, as elsewhere in this series, Picasso's idea of a stylish contemporary dress, with decorative shoulder pads and lapels, which may have suggested the idea of transforming Dora into Joan wearing armor as seen in the present painting, the only time he has portrayed her this way. Coming from the artist who painted Guernica and abhorred war, there is clearly an ironic element in Picasso's depiction of Dora as Jeanne d'Arc. There was surely the need for someone to stand up to Hitler and fascism, but to resuscitate a legendary figure of yesteryear was hardly a realpolitik response to this crisis, and Picasso was surely poking fun at those who hid behind the false security of such patriotic symbols and myths. This painting is perhaps his distaff counterpart to the depictions of burly male types, hardy mariners and fishermen, whom Picasso painted and drew, showing them licking ice cream cones and sucking on lollipops during the summer of 1938, during his last pre-war holiday sojourn at the Hôtel Vaste Horizon in Mougins (Zervos, vol. 9, no. 205; fig. 5). Picasso appears to have devised this peculiar theme as a means of commenting on the futile, impotent efforts of Allied statesmen to curb Hitler's territorial demands. The negotiations that resulted in the Munich Pact began during the summer, and the document was signed on 29 September 1938. Instead of tending to their true manly business, Picasso's sailors instead take time off for sweetly passing pleasures, of a kind that was all the fashion on the Riviera that summer, especially among women and children. A durable and lasting peace in Europe, Picasso seems to argue, would surely melt away just as quickly as the ice cream and candy in these mighty fellows' snow cones and lollis. Dora Maar would remain the central, defining presence in Picasso's wartime paintings (fig. 6). Picasso painted both Marie-Thérèse and later his second wife Jacqueline about as often as he portrayed Dora, but Dora figures far more prominently in the overall profile of Picasso's art; his paintings of her, dating to the most historically critical ten-year period of the 20th century, have exercised a far greater impact on the course of modern art. "Passionate, jealous, and quick-tempered, [Dora] pleased Picasso all the more because with her he could play all the games of a romance à l'espagnole," Pierre Daix wrote. "He enjoyed mastering her, forcing her to accept sharing with Marie-Thérèse and with others. Dora, for her part, was an artist as well as being attracted by the man--she fully appreciated association in an unprecedented adventure as modernism assumed the highest ambitions of grand art in the past" (Picasso: Life and Art, New York, 1993, pp. 253-254). Sharon Kim, International Director, Impressionist & Modern Art, discusses Pablo Picasso’s Buste de femme, to be offered in the upcoming Impressionist and Modern Art Evening Sale on May 6.